A hot tub can be one of the most relaxing, rejuvenating adult activities, especially since routine maintenance is fairly minimal and not all that complicated. In fact, a child could, and would probably even enjoy participating. The kids might see the hot tub as place to splash, fill up a water gun or compete to see who can hold his or her breath the longest, but it can also be used as a tool to teach valuable lessons about the importance of properly caring for an investment, as well as behind-the-scenes responsibilities — cleaning, hot tub chemical use, and overall upkeep. The spa is a family luxury, and treating it as such means involving the entire family in its upkeep. Encouraging every member of the family to participate will likely only make everyone appreciate it even more. Especially because upkeep is not necessarily a challenging or time-consuming task and always leads to a reward: a fun, relaxing place to unwind after your work is done. Consider giving each child a designated responsibility — using the water vac to clean the debris out of the bottom of the tub or checking water levels and filling with a garden hose when needed (don’t forget the pre-filter attachment). With parental supervision, kids can also help test the chemical levels and determine what, if any, action is required. If nothing else, the kids will be well versed in pH and chlorination long before they enroll in their first chemistry class at school. As for parents, you can feel good about giving your kids a mini-science lesson, all while receiving a helping hand in the process. Arguably the most essential part of hot tub maintenance is checking and maintaining spa chemical levels. This should be done several times a week and can be a fun and educational way to get the kids involved. Whether they are helping parents to examine alkalinity and pH with a testing strip, sanitizing the water with bromine and chlorine, or disinfecting it with a shock treatment, kids are reminded of the careful attention that goes into maintaining water clarity before all the fun happens. Remind them that without the proper chemical levels, hot tub water can become cloudy, irritate their skin or even become a breeding ground for unsafe bacteria. 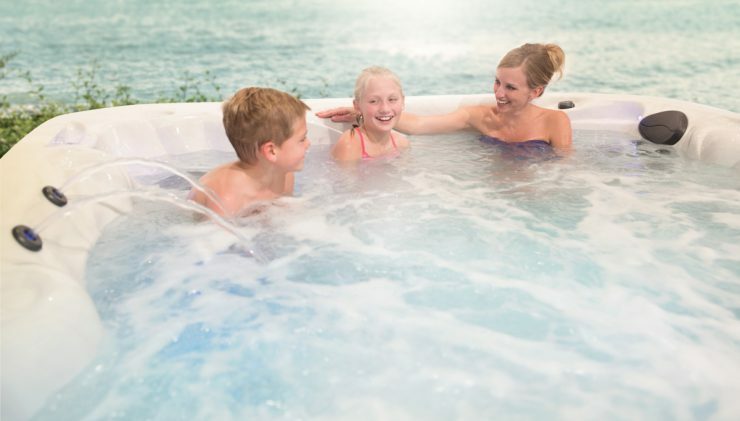 Being involved in hot tub maintenance will help kids appreciate and take pride in the family investment. It will no longer just be an imaginary ocean, a place where Barbie gets lost at sea or an area to practice snorkeling, but a place where the family can learn, work and play together. 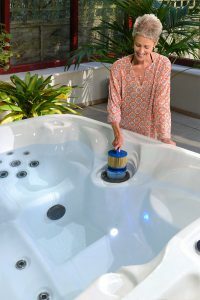 For more information about maintaining your hot tub, download our Hot Tub Maintenance Guide. Remember to never leave children unattended around water. In addition, always keep chemicals out of reach of children, and do not allow children to handle chemicals without proper supervision and precautions.